She tsk tsked when she emptied the dishwasher. Turns out he hadn't loaded it properly. Not only that but last time he emptied it he apparently emptied it the wrong way. Now how could there be a wrong way to empty the dishwasher you might ask. Well, I'll tell you. When he loaded it he placed the knives in the back right hand corner of the cutlery rack. He placed the forks at the left front and the spoons in the empty spaces in between. Wrong she said. The knives go at the front left. The forks at the back left and the spoons on the right. Now if that wasn't enough to magnify his faults in loading the dishwasher, she barred him from loading it in the future in addition to emptying it. 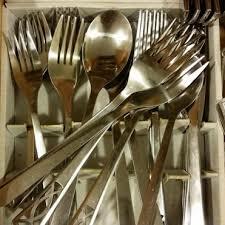 Turns out he unloaded the cutlery first, then the middle drawer with glasses and finally the bottom drawer with plates and bowls which for her was wrong. She redoubled her criticism barring him from unloading the dishwasher. The proper way she said was the bottom drawer of plates first, then the glasses and concluding with the cutlery. This way, the queen of the house said, the lower drawers wouldn't get dripped on. Oh, okay, he said. Now the first thing I, erm, I mean he thought was this is not my, I mean his father's OCD. Not that his father had noticeable OCD. He was thinking of that Buick commercial for some reason. Probably because he washed the car wrong. Now from time to time he'll go around the house straightening things like magazines, CDs books and the like. But his OCD is nowhere near as bad as her's and the damn dishwasher. Years ago he was forbidden from doing the laundry because he threw a red sweater in with the whites, which ended up pinks. If he redoubles his helpful efforts he soon won't have to do anything around the house. Not a bad strategy, eh men? The prompt from the folks at Two Word Tuesday is redouble/magnify this week. I'm writing for a friend. Oh no. Let's NOT get into the dishwasher thing, 'K? That will certainly redouble the efforts of the men in white coats coming to get me. I knew it! It's a male conspiracy. No it's female OCD and who am I, I mean who is he, to argue. Tara: no it's female OCD and who am I, I mean who is he, to argue. Refine: (i must have left this comment three times now) I've seen those guys peeking in my kitchen window. Oh, wait. It's the guy painting my house. Refine, ha ha. I meant Reffie. Paula: what are you talking about? I have one of the tidiest collection on the planet.